The 30.4 metre motor yacht Etoile d’Azur, listed for sale by Antoine Larricq and Josh Gulbranson at Fraser, has had a price reduction of €510,000. Etoile d'Azur was built in steel and aluminium by Dutch yard Moonen for an experienced owner and launched in 2008 to Lloyd’s class and MCA coded with her most recent refit in 2016. She is a twin-screw displacement motor yacht styled by René van der Velden with naval architecture by Diana Yacht Design. 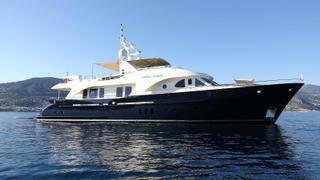 One of the yard’s Moonen 97 series, she offers a long range and is a seaworthy vessel with a lot of comfort. A truly proven bluewater yacht, she has multiple transatlantic crossings under her belt. The interior is styled by Art-Line Interior Design and incorporates cherry wood joinery with a light maple trim complemented by pale carpets and fabrics. Accommodation on board this yacht for sale is for eight guests in four staterooms, including a master suite, VIP stateroom and two twin cabins, all with en suite bathroom facilities. In addition, her crew quarters sleep four members of staff. Her sun deck is ideal for entertaining and can also carry a tender and two personal watercraft. Twin 600hp Caterpillar engines give her a cruising speed of 12 knots and a range of 4,500 nautical miles at an economical speed of nine knots. Etoile d'Azur is now asking €6,490,000.